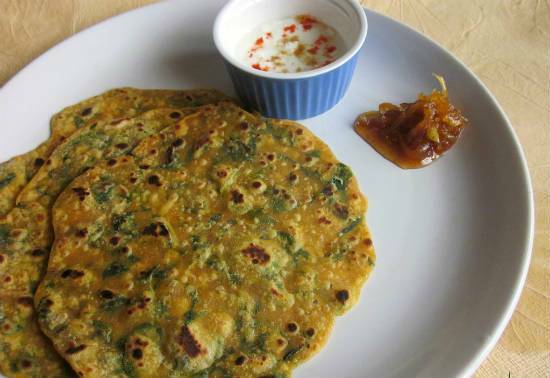 Theplas are a popular Gujarati dish ideal for picnics or travelling as they stay good for several days. 1. Mix the flours, salt, sesame seeds, red chilli powder and garam masala powder in a large bowl. 2. Add ghee and fenugreek leaves. 3. Pour yogurt and knead well to a smooth dough. 4. Add 3 to 4 tsp oil and mix. 5. Keep covered for 30 minutes. 6. 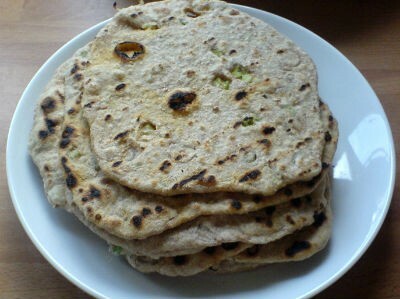 Make small balls of the dough and roll them into small/medium theplas on a lightly floured surface. 8. Cook the prepared theplas for 20 to 30 seconds on each side, adding oil around the edges. 10. Serve hot with plain yogurt and pickle. 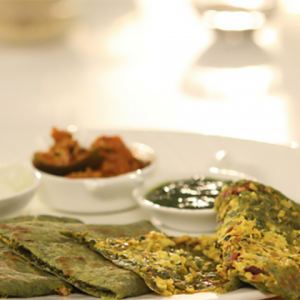 Feel free to comment or share your thoughts on this Thepla Recipe from Awesome Cuisine.